Summer has arrived to the Mediterranean city of Barcelona and so have the high temperatures. If the heat doesn’t let you think, here you have the best spots in the city to get the most flavorful and creamiest of ice creams! Let the ice cream season begin! Located in the neighborhood of Sant Antoni, Sirvent is one of the oldest and sweetest shops in Barcelona. Founded in 1920 by a family from Xixona, their two specialties are traditional homemade nougats and horchata de chufa which is a refreshing beverage made with tiger nuts, water and sugar. Throughout the years, this family has kept the quality of their products and increased the diversity by offering a large selection of ice-creams and flavorful slushies. Do not hesitate to go for the traditional sweets! Walking down las Ramblas, you will find the most blossomy ice cream cones in the city. Shaped like roses, these ice creams are exotic but also organic and vegan friendly. These creamy bunches of roses have conquered the heart of Barcelona and other European cities such as Paris, London or Berlin. The crowds in front of their shops are very much a part of the summer scene. A gourmet product, this Italian gelato flower is the perfect combination of beauty and taste! Discovering the 2000 years old Barcelona while enjoying an authentic artisanal ice cream sounds like a plan! In the heart of the labyrinthic Gothic area of Barcelona you will find Gelaaati di Marco, with as many types as tastes to suit your curiosity: low sugar, gluten free, lactose free, vegan, organic milk based, and more! Some of the most unusual flavors of ice creams are gorgonzola, basil, chai tea or even their mojito sorbet! There is something for every person and occasion in this ice cream shop! 4. Ottavia Gelateria, Passeig de Gràcia, 126.
fter a long shopping day through the most exclusive boutiques of Barcelona you deserve an ice cream! If you want to delight yourself with some exotic options, this is your place. Here you can find something that you cannot find anywhere else in the city: Gazpacho ice cream! Can you believe it!? You need to taste it! Yes, the ice wave is here! 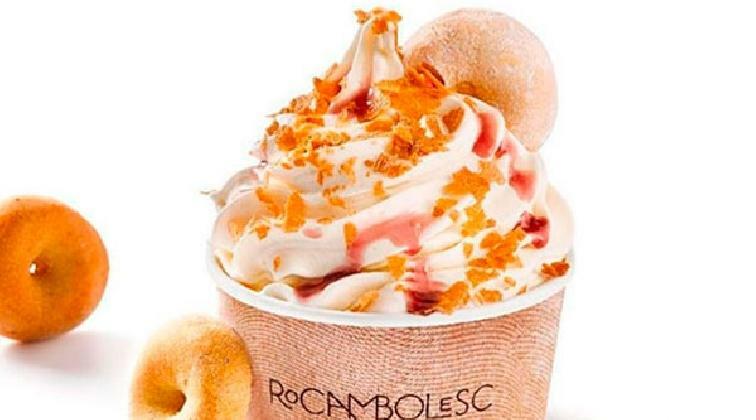 A new style of ice cream is spreading in Barcelona: Thai rolled ice cream. The popular treat in Thailand, Malaysia, Cambodia and the Philippines, where it is often sold by street vendors, has arrived to the cosmopolitan city of Barcelona. Have you ever tasted it before!? This is your chance! You might be wondering how these rolled ice creams are made. Well, watching the chefs prepare them is almost as exciting as eating them. Delicious show to the palate and the eyes! Ice creams are pure happiness, says Jordi Roca, Best Master Baker in 2014 as well as one of the owners of Celler de Can Roca restaurant. This award-winning chef wanted to make this world a sweeter place and always dreamt about having his own ice cream shop. Rocambolesc is a place where creativity, science and food come together. If you enjoy fine cuisine and extravagant risky new combinations of flavors this is your place! If you are a fan of Game of Thrones they will surprise you with an ice cream shaped like the hand of Jamie Lannister made of blood orange and mango! You could also take a walk on the dark side and enjoy the Darth Vader sorbet made from blueberries and vanilla. Another highlight would be the watermelon, lime, black sesame and coco sponge cake ice cream! You cannot miss it!